The financial numbers suggest Valero Energy stock should be cruising in 2014, but performance to date shows a different reality. What's up with the mediocre 7% return? Ethanol isn't the only reason shares should be flying high. Increased throughput and advantaged margins for sour and North American light crude oils compared to Brent crude improved the operating income of Valero's refining business 17% in the first half of 2014 compared to the year ago period. When combined with operational gains from ethanol and a 2.3% reduction in outstanding share count, stockholders have seen earnings per share improve 36% over the comparable market period. In addition, the company's dividend has increased 25% and its recent spinoffs Valero Energy Partners (NYSE:VLP) and CST Brands (NYSE:CST), respectively the former pipeline and retail businesses of Valero, have unlocked great value for shareholders. Yet, somehow, Valero Energy stock has only gained a mediocre 7% so far this year -- underperforming the lackluster S&P 500 and its pipeline spinoff -- after gaining nearly 50% in 2013. Two major factors are coming into play. First is the simple fact that Wall Street's consensus estimate for second-quarter earnings missed Valero's actual results (remember, it's not the other way around). Results improved mightily over last year, but Mr. Market responded to its own misguided targets by slashing future projections for EPS and share price. Not the most logical sequence of events, perhaps, although investors know to expect that when reality ruins Wall Street models. Second is the unexpected news that the United States is considering allowing companies to regularly export condensate, an important petroleum feedstock, for the first time since 1975. It already granted two licenses this year. That has the potential to wreak havoc on the bottom lines of refiners, which are enjoying record profits by taking globally cost-advantaged petroleum products such as condensate from energy plays in the United States, refining them into value-added products, and selling them to global markets. If oil producers are suddenly allowed to export their cheap condensate to international refiners, American refiners could lose their competitive edge when it comes to feedstock pricing. They would still likely boast advantages when it comes to powering their refineries, but margins would erode substantially. Buying opportunities can arise when Wall Street misses reality for a solidly profitable company. However, allowing the export of oil products is absolutely a reason for muted optimism moving forward. Valero's meteoric rise since 2011 has been built on ultra-high operating margins fueled by cost-advantaged petroleum feedstocks. If that is taken away -- which is a very real threat right now -- then the company's operating profit for its refining business will surely follow. Investors may find some insulation in an unexpectedly strong ethanol industry, but thanks to subsidies and political agendas, biofuels are traditionally more volatile than petroleum. 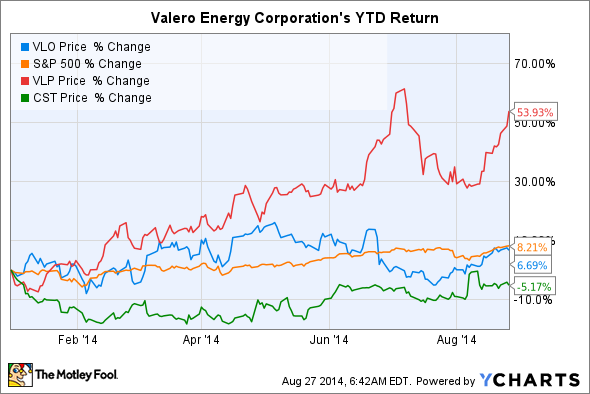 In other words, Valero's modest performance in 2014 may be a sign of things to come.